In addition to helping new residents get their driver’s licenses and identification cards, MVD Express is also happy to provide other information to help newcomers assimilate to the local culture. If you live in New Mexico, or even if you’ve visited for a few days, you have probably heard the official state question: red or green? So, what’s the difference between red and green, and what do you need to know in order to answer the question correctly? We’ve got all the answers here! It’s no secret that New Mexicans are hooked on chile. From the time children are young, they’re slowly introduced to the slow burning heat of the chile–that heat is what makes New Mexican dishes so tasty! So what’s the difference between red and green chile? Young New Mexican-grown chiles are green. During this stage in the chile’s growth, the capsaicin (the substance that makes the chile hot) concentration is high, giving the chile a spicy flavor. 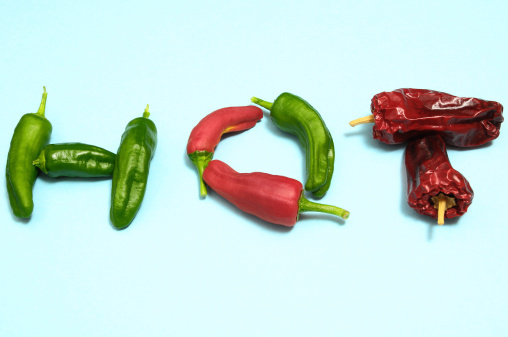 Although the green chile can be considered extremely spicy for some people, it only rates between 500 and 1,000 on the Scoville Rating System that goes all the way up to 300,000 (habaneros have a Scoville rating of over 200,000). As New Mexican chiles begin to mature, they lose their green color and darken to red. The flavor of the chile also begins to mature, changing from the raw heat of the green chile to the sweeter and mellower flavor of the red. Don’t be fooled, though! Red chile can produce some serious heat! Most New Mexican chile is grown in Hatch, New Mexico and sold in pods, powder and canned form. You can use either red or green on almost any type of New Mexican dish! Some New Mexicans say that green chile is the only way to go when ordering New Mexican food. But that’s not the only way to go! You can choose either red, green or both (“Christmas”) mixed into your plate. It all depends on your preference with flavor and heat. Have fun!